The Cultural District has been organizing these gallery crawls for the past few years – I have made it down town for a few of these friday evening events and it is always a great and interesting time. 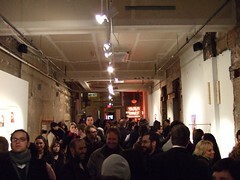 All of the Gallerys along and near Penn Avenue open their doors and put out a spread of snacks. Since it is July and warm enough to be outside I think that tomorrow’s Gallery Crawl will be extra fun with lots of outdoor activities too. Check out the entire huge list of gallery crawl events here. « Share Your PGH Photos HERE!